Cloudy Bay of course is New Zealand's most iconic brand whose Sauvignon Blanc brought worldwide attention to this variety and to Marlborough's wine industry. 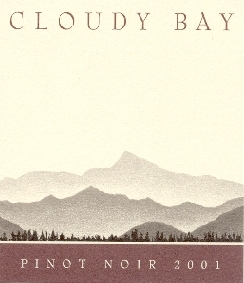 The Cloudy Bay Pinot Noir is not as well known but has produced very good wines dating back to the inaugural release in 1989. The winery has a purpose-built Pinot cellar to handle unique parcels of wine from 25 different sites. Cloudy Bay Vineyards was founded in 1985 by Cape Mentelle Vineyards in Western Australia. The name is taken from the bay at the eastern extremity of the Wairau Valley, which was named Cloudy Bay by Captain Cook on his voyage to New Zealand in 1770. The winery and vineyards are located in the Wairau Valley in Marlborough. The winery calls on several estate vineyards as well as five local growers for its grape supplies. Cloudy Bay has been a pioneer in sustainable vineyard management in New Zealand. Cloudy Bay sponsors an annual mid-winter celebration of Pinot Noir called Pinot at Cloudy Bay. The winery Cellar Door is open for tasting. The wines are imported by Moët Hennessy USA, Inc., NY, NY.